Interesting article in the Minot Daily News today about Minot State attempting to get their hockey program to move to NCAA Division 1. I'll give the cliff notes. - Two recent moves were cited. Penn State made the jump due to a $102 million donation from an energy guy. This is completely unreasonable to expect. However, Arizona State also made the jump recently. 4 donors combined to contribute $32 million in start up capital. This is the model Minot is hoping for. - They target needing about $37 million to put into an endowment. That way, the yearly budget can be about sustained off interest alone. They believe they already have $10 million pledged. I believe it would be very successful if they find the money to get it going. The area would support it. They already have pretty good support considering they are a club team. Thoughts? I didn't realize hockey was that big in the north central/northwest area of the state. I suppose they could get some following from Saskatchewan as well. Would they really draw well enough to support the program? I assume there is an existing ice arena in Minot. What is it called and where is it at? How many people will it hold? Why wouldn't they get their other programs fully funded before stepping into a cost intensive program like Hockey? I believe Jamestown University is starting a D1 hockey program next winter. I think they have hired a head coach and have been accepted into a conference also. Very, very expensive undertaking for any school. As a Minot State Alum, I could not agree with Hinsa more - they need to get their other programs running at a DII level before they start adding a very expensive program like hockey. I don't see the All Seasons Arena (is it still called that?) as a D1 arena at all. Hinsa wrote: I didn't realize hockey was that big in the north central/northwest area of the state. I suppose they could get some following from Saskatchewan as well. Would they really draw well enough to support the program? The All Seasons Arena would be used. It's at the fairgrounds. Wiki has it at a capacity of 3,900. That's bigger than Ferris State's and about the same as Northern Michigan. It certainly wouldn't be the best facility, but it would suffice. The Canadian connection would probably draw fans along with being a great avenue for players. Minot's location makes recruiting football a huge challenge, but it would actually be an advantage for hockey. I agree with needing to get the other sports fully funded (although they already are at the max scholarship level for football at least). I believe the hope is by having a D1 program, that can help generate excitement towards the school which would help everything else in turn. Honestly, I think based off location, hockey is the best sport to stand a chance there. Women's soccer and softball have been successful, but I think hockey could pretty quickly slot in right behind them as the most successful one at the school. Sportsrube wrote: I believe Jamestown University is starting a D1 hockey program next winter. I think they have hired a head coach and have been accepted into a conference also. Very, very expensive undertaking for any school. As a Minot State Alum, I could not agree with Hinsa more - they need to get their other programs running at a DII level before they start adding a very expensive program like hockey. I don't see the All Seasons Arena (is it still called that?) as a D1 arena at all. Edit* Jamestown is also entering as an independent. Minot State also operates as an independent. In their case, it makes more sense for flexibility purposes in scheduling than joining a conference just to be in a conference. As a graduate and having 2 kids attending, one on the track and field team, it would very disappointing to see that level of money going to a new sport. THEY DON'T EVEN HAVE A TRACK! I suppose if money is donated it will get it off the ground but many of MSU programs are not very competitive in the NSIC. They are getting better every year though, and I would hate to see any take a step back. If you can show me how it won't affect existing programs, I'll be all for it. Thanks for the information Indy5, that clears some things up for me. I still would like to see Minot State get their other programs more competitive before they take the very expensive leap into D1 hockey. (and I am a big hockey fan) I think this will set a number of their other programs back due to money being funneled away from them and into this new program. triplebbb wrote: As a graduate and having 2 kids attending, one on the track and field team, it would very disappointing to see that level of money going to a new sport. THEY DON'T EVEN HAVE A TRACK! I suppose if money is donated it will get it off the ground but many of MSU programs are not very competitive in the NSIC. They are getting better every year though, and I would hate to see any take a step back. If you can show me how it won't affect existing programs, I'll be all for it. I hear your concerns. Now that the football stadium is finally done and the video board is in the dome, I believe their next project is remodeling Allen Field north of Herb as a track and field facility. From what I took out of Hedberg's quotes, they essentially want to get the hockey program running based solely off private investment. That way, the school wouldn't really have to use its current budget on hockey, and it could still work on improving the other sports. Hedberg stressed they wouldn't do the hockey thing if it lead to having to cut any other sports. Really looking forward to the University of Jamestowns hockey season. Considering our high school team has been almost unwatchable the last 15 years it will be nice to see a team compete and actually be physical. I really think the community will support it. What kind of attendance does Minot St bring in? I see all 4 series with you guys is a home and home series. The attendance would kind of depend on who their playing. When Jamestown comes in, I would expect a pretty good crowd. 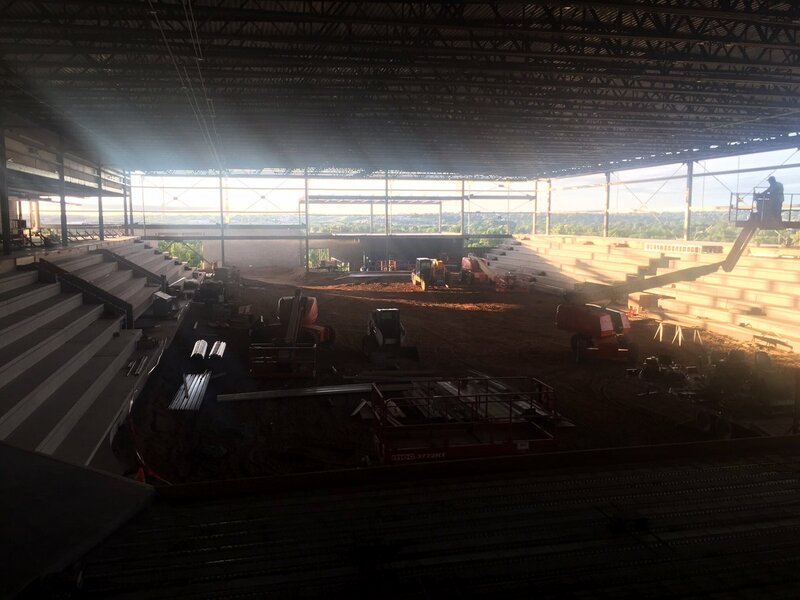 Don't forget that they are building a new rink that's about twice as big as their last one. That should bring in some fans as well. go maji wrote: The attendance would kind of depend on who their playing. When Jamestown comes in, I would expect a pretty good crowd. Don't forget that they are building a new rink that's about twice as big as their last one. That should bring in some fans as well. Yep. Son played up there for the Blue Jays and I saw the construction this winter. Looks good. Jamestown opens the season in Manitoba taking on the Manitoba Bison. The same team UND has opened with the last handful or so years. Could be ugly. Bison have always lost to UND but have always been competitive. First home series is with NDSU. hockeynut wrote: Jamestown opens the season in Manitoba taking on the Manitoba Bison. The same team UND has opened with the last handful or so years. Could be ugly. Bison have always lost to UND but have always been competitive. First home series is with NDSU. Similar schedule to Minot. They'll take there lumps along the way, but it's all part of the process. A good measuring stick for them would be NDSU. They're in d2. If they blow them out, they could be in good shape. But overall, a very tough schedule. Has Minot played the "Bisons" of Manitoba? Don't sound familiar. They don't play too may Canadian teams. They only play one, Briercrest, from Saskatchewan. Hard to believe the Jimmies drop the puck 2 weeks from today in Manitoba. So looking forward to see how they look in 3 weeks when NDSU is in town. A lot of buzz in town about this inaugural season. Wilson Arena will be full for sure.